A decade ago Joanne Walker left the reservation and never looked back. But now her father is missing and she'll have to go face her past, and the child she gave up. But facing her fears soon becomes the least of her problems as what she finds there, rocks her to the core. The mountains are crying as they are literally being torn apart by an unseen malicious force that consumes everything in its path, including her son. It will take every bit of knowledge she has gained and then some to survive what is coming. What really makes this series for me is the characters. I absolutely love the entire cast, but my favorites have to be Joanne, Morrison, and Gary. The last book was incredibly thin on Morrison moments, but heavy on Gary (and of course Joanne as she's the narrator.) This time around, Morrison was front and center, and it was Gary that was left behind. I really loved seeing Joanne and Morrison together as it has been a VERY long time coming. There's just something about the two of them that really works, especially since he is able to just go with the flow of all of her magical craziness. Honestly, I was getting to the point where I felt like they would never get any time together. While things weren't exactly fun and games in this book, there were plenty of sweet moments that almost made up for the long wait. That being said, now that I've enjoyed the two of them together in MOUNTAIN ECHOES, I'm really anxious to get to the next book to have Gary back again. I really missed his excitement about all of the magical stuff. Seriously, he is the best side kick ever, so if you haven't read his story, NO DOMINION, you'll definitely want to check that out. With each new installment the magical and fantasy aspects of this series gets ratcheted up another notch, to the point where it is almost overwhelming at times, but not quite. There's just something about the way the author paints such a vivid story that really draws me in. It honestly is impressive that she has been able to step her game up that much to make each new showdown that much harder. But even more important is that she has ramped up the character growth as well. Joanne may have been getting more and more powerful, but it wasn't an easy road, and she had to endure an incredible amount to get there. I just really appreciate that things haven't come too easy and honestly it's what make this series the best kind of books. It's always bittersweet to read the last few books in a series as it is incredibly excitement to watch everything build to the boiling point, yet the entire time you know the journey will ending soon. In MOUNTAIN ECHOES, you could really tell that things are winding down to the final showdown. Based on the way things are headed, it promises to be an epic conclusion, but I'm still going to be very sad to say goodbye. So for that reason, I'll both be eagerly awaiting and dreading the release of the final installment. 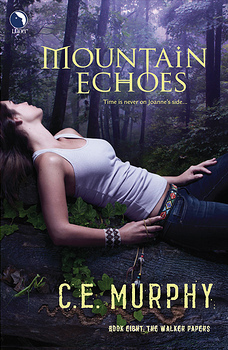 Every bit as good as its predecessors, MOUNTAIN ECHOES is a delight that will please fans of the series.